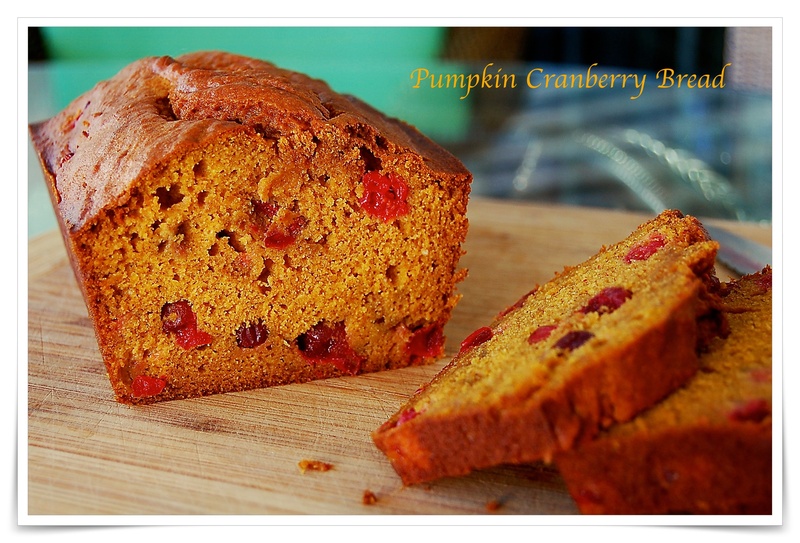 A perfect fall weather treat at pumpkin and cranberry time a moist pumpkin and cranberry loaf. Nicely flavored with the usual goes with pumpkin spices an easy recipe made and baked in an hour. I think a nice maple cream would be a nice addition to serve with the sliced bread. I am not a huge fan of whole wheat flour perhaps because I had a big container and it must have been old since the very strong flour made for a lousy tasting cornbread, but I have learned to buy small bags and the pumpkin bread was perfect. Ellie Krieger’s Pumpkin Cranberry Loaf is good pantry goods friendly recipe the exception the fresh cranberries. I normally buy several bags and freeze them to have throughout the year. Each slice has a little tart bite here and there of course I tasted tested it when I had my cup of tea this afternoon. I did follow Ellie’s recipe, but my loaf baked in a mere 45 minutes compared to the 50-60 minute time given. In a large mixing bowl, whisk dry ingredients and in another smaller bowl whisk all of the wet ingredients until combined. Stir the dry ingredients into the wet ingredients, mixing just enough to combine evenly. Gently stir in the cranberries. Pour the batter into the prepared pan. Bake until the top is browned and a wooden skewer inserted into the center comes out clean, 50 to 60 minutes. Allow to cool in the pan for 15 minutes and then transfer the loaf to a baking rack to cool completely. transfer the bread to a wire rack to cool completely before slicing. ***Below is a link to Food 52 and a maple cream that I have made several times.